As an internet saying goes, “I felt attacked” as I watched Zombie Asian Moms. Kate Rigg and Lyris Hung’s latest show about Asian matriarchs hit a little too close to home. The stage is lined with the iconography of an Asian upbringing–like a line-up of shoes. I chuckled during the transitional intervals when Rigg lugged in giant Sriracha sauce bottles which I had initially mistaken as baby bottles. That visual suggests that Asian children, me included, have often been bottle-fed a cultural allegiance that could burn them from the insides. With the combo of eccentric visuals, music, sketches, and documentary, Rigg explores the comedy and complexities of the quirks of Asian moms who criticize—and love—too much. If you’re Asian, you’ll most likely relate. If you’re not Asian, you’re welcomed to look into this world. The play opens with an electric violin overture by Hung and a screened montage. Doing her impression of her late mother, Rigg struts in in the guise of her mother, a lovably cranky and criticizing Tiger Mom, brought back from the dead through the magic of theater. This mother sits at her armchair, venting about her daughter Kate. She may be dead but she’s still going to nitpick her daughter from beyond the grave. Even as a spirit, she’s not over her daughter choosing acting over medical school. The fact that her daughter ended up at The Juilliard School was just a betrayal her heart couldn’t take. 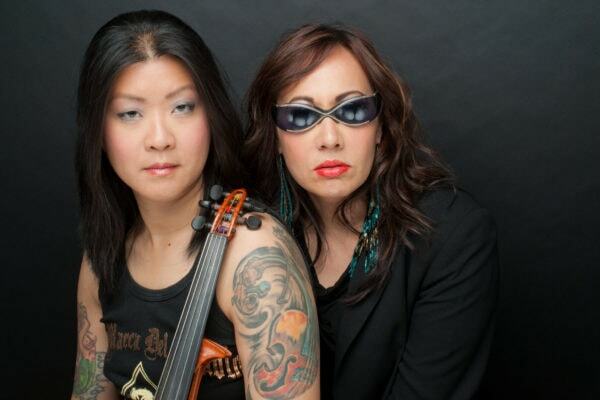 Woven in are comedic rock anthems to the Asian American experience and an in-progress documentary with the testimonies of mothers and daughters. I’d be lying if I said I didn’t cringe at Rigg’s punchline to her personal narrative, not because of the execution but because it struck my own personal chord. Rigg recounts that her mother on her deathbed told her, “Not too late to apply to medical school.” I had a Tiger Father who was true to the “Discipline never dies” philosophy as one of the songs goes. On his death bed, he told me “You have to become a lawyer.” I realized I wasn’t alone in having an Asian parent who tried to navigate my career from their death bed. Rigg probably would be shocked to learn that my mother was not someone I could call a Tiger Mom, though she displayed some of the symptoms. The songs strike the right comedy notes with quirky verses that deploy relatable gags about the Asian American experience. The number that hit me was “I bet you didn’t know that you’re Chinese” which covered the way white Americans tend to toss out the “I know you’re” Chinese. As a Vietnamese American woman, I’m surprised Rigg never talked about getting Ni Hao-ed down the street like I have in New York City. During the song number “Sandals and socks,” I scratched my head at Rigg’s notion that Asian mothers go outside with socks and sandals, but bam, I had flashbacks of my cousins and relatives wearing, GASP, socks within sandals. She also explores the aspiration of whiteness in Asian Americans, recounting that time her mother gave her a blonde wig and blue-colored contact lenses to increase her self-esteem. While nothing in my own upbringing never went THAT far, I definitely recalled moments where my family tried to live white–like celebrating Christmas as Buddhists or having Thanksgiving turkey like the white families in the commercials. If I could take a moment to sound like a stickler Tiger Mom, I felt the imagery on the projections left something to be desired. The production would sharpen if a majority of the images felt better timed to the comedy. As I attended the second preview, the production is undergoing some fine-tuning. When the documentary is finished, it would be nice to see the names of its interviewees credited. We’re in the age of Crazy Rich Asians where Asians American artists are starting their journey to saturate the mainstream, smash stereotypes, conquer erasure, and reaffirm cultural identity. Zombie Asian Moms dutifully and rebellious checks off these goals. Fellow Asian kids, you don’t have to agree with your moms’ methods. In Rigg’s experience, she suggests it’s not impossible to appreciate what these mothers have gone through.